How and where can I download free eBooks for my ARCHOS eReader? You will find a list of web sites where you can select free eBooks to download. First download your selected ebooks onto your computer then connect your ARCHOS eReader to your computer via USB and copy the eBook files to the eBooks folder. Disconnect and find all your eBooks by selecting “eBook”. 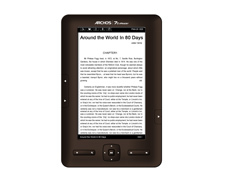 Can I download a pay eBook from any Online store and read it on my ARCHOS eReader? You will be able to download any pay eBooks from any online stores. Your ARCHOS eReader is ready to receive any secure EPUB or PDF formatted eBooks protected by “ABOBE® READER® MOBILE”. Before you download a pay eBook from an online store, go to https://www.adobe.com/cfusion/membership/index.cfm and create your personal account. You will automatically get an Adobe ID number and Password. Keep this handy as you will it when downloading a book. Now download pay EPUB or PDF formatted eBooks onto your computer. Then connect your ARCHOS eReader to your computer via USB and copy the eBooks to the eBooks folder. Disconnect and you can then find all your eBooks by selecting “eBook”. Can I store and listen to music on my ARCHOS eReader? You can store and listen to all MP3, FLAC, OGG and WAV music files. Connect your ARCHOS eReader to your computer (Windows, Mac or Linux) and copy music files to the “Music” folder. Then disconnect your ARCHOS eReader from your computer. Click on the “Music” icon to access to all your music. Can I store and watch photo on my ARCHOS eReader? You can store and watch all JPEG and BMP photos files. Connect your ARCHOS eReader to your computer (Windows, Mac or Linux) and copy image files to the “Pictures” folder. Then disconnect your ARCHOS eReader from your computer. Click on the “Photo” icon to access to all images. Can I store and watch videos on my ARCHOS eReader? You can store and watch all MPEG-4, H.264 and FLV videos files. Connect your ARCHOS eReader to your computer (Windows, Mac or Linux) and copy video files to the “Video” folder. Then disconnect your ARCHOS eReader from your computer. Click on the “Video” icon to access to all videos.